Quite apart from being a contemporary of Brahms and also writing four symphonies, Gernsheim clearly found the Brahms orchestral style utterly congenial. The Second Symphony has an easygoing sidling eloquence that is most attractive in the first movement. There's a pulse-racing tarantella of a second movement. The finale clearly doffs the hat and bends the knee towards Brahms' First Symphony and this works with conviction all the way to a sturdy close. The Fourth Symphony opens in four-square joyously peeling energy. Gernsheim clearly loves Brahms' winding tendril woodwind writing and he is up for some muscular jollity in the finale. These two symphonies approach the last word in succinct expressive power and the invention is something of quality. 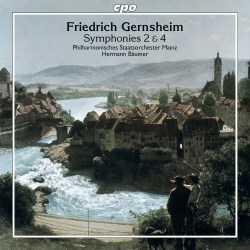 This disc is the second of a pair from CPO covering all four Gernsheim symphonies. The first volume was reviewed by Jonathan Woolf here. The two-disc set of all four from Arte Nova (74321 63635 2) is played by the Staatsphilharmonie Rheinland-Pfalz conducted by Siegfried Köhler. That dates from 1999 and is probably not that easy to get hold of although secondhand copies do turn up on Amazon. I have not heard that set recently but I note that the timings are about the same as here. Bäumer, having contributed the Foerster symphonies in Osnabruck for MDG (review review), is well up to the Gernsheim challenge as is his Mainz orchestra. The makings of the revival are further evidenced by the Violin Concertos (CPO), Piano Quintets (CPO and Toccata Classics), Piano Trios (Antes) and the diminutive Cello Concerto (Hyperion) courtesy of Alban Gerhardt. Matthias Corvin's liner essay is a good example of its sort and stands well clear of some of CPO's worst excesses of the past. The essay is in German and English. Sound quality is as well rooted as the music.